1. Cook the potatoes in boiling water for 15-20 minutes until tender. Drain and mix with the cucumber. In a bowl stir together the mayonnaise, mustard, half the lemon juice with seasoning and toss with the warm potatoes and cucumber. 2. Preheat the grill to high. Brush the mackerel with the remaining lemon juice and season then grill for 4-5 minutes on each side until the flesh is firm and flakes easily. 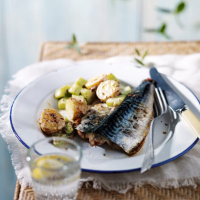 Arrange the warm potato and cucumber salad on serving plates and place the mackerel fillets on top. Serve. Serve any leftovers cold as a salad the following day. The potato salad is also an ideal accompaniment to oily fish such as salmon or sardines. This flavoursome fish with mustard is simply crying out for a bright, crisp white. Try this fabulous Italian example: Zenato Villa Flora 2009 Lugana, Veneto, Italy.